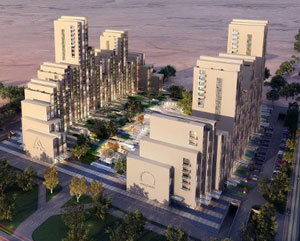 Local real estate firm Zardman is developing ‘Aura Erbil’, a mixed-use project in Erbil, Kurdistan. The development comprises 16 buildings, including three office towers, a five-star hotel, and residential buildings and retail zones. The development stretches over 40,000 square meters of land, with 14,000 square meters dedicated to landscaping. The planned built-up area totals 200,000 square meters. Investments in Aura Erbil reached $110 million, according to Hovsep Lochkajian, Managing Director at Zardman - Iraq. The development is owned by Zardman and other partners. Zardman’s major shareholders include George, Tarek, and Makram Zard Abu Jaoude, and Guy Manoukian. Soma Architects designed the structure, and the main contractor is Kele, an Australia-based firm. Lochkajian said: “The development will offer 269 residential apartments distributed across buildings of various heights, ranging between eight and 23 stories.” The plan also involves establishing the Aura Souks, a major retail area in the central area between the towers. Excavation works have already been completed and the company is now waiting to obtain the construction permit. The project will be executed over seven phases and requires three to four years for delivery.